Here, as promised, is the expose of the first of the earliest, least-known, if not totally UNKNOWN, UNSUNG HEROES of the American Revolution. Lee smuggled funds and war materiel funneled from Holland through France and Spain to Massachusetts at great peril to himself and to his family! Since virtually all American records were either lost or intentionally destroyed at the time of the revolt against their British overlords, little is known of the methods chosen by colonists to import the supplies and armaments needed to aid the organizing insurgents. France and Spain were willing to help, but covertly. Some insight can be gained from the role of Colonel Jeremiah Lee, successful shipping magnate and devoted revolutionary patriot, who is largely neglected in history books. 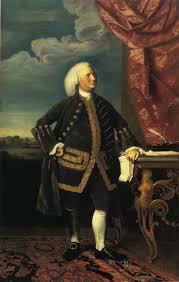 He served for twenty-five years as a colonel in the British militia at Marblehead, Massachusetts. In 1774, in collusion with French and Spanish shippers, at great danger to himself, Colonel Lee initiated covert importation of armaments. It is unclear whether the arms originated in Holland, France, or Spain, but they were routed to Massachusetts through Lee’s shipping agent, Joseph Gardoqui et Fils, in Bilbao, Spain. At the same time, Lee served as liaison between the citizens of Marblehead and the British king’s agent in Boston, giving voice to the colonists’ grievances. Colonel Lee was, according to the 1771 Massachusetts tax records, the wealthiest merchant in that colony during the pre-revolutionary period. He was very likely America’s largest colonial ship owner, holding full share in twenty-one vessels, mostly fishing and trading schooners from seventy to one hundred twenty tons each, and at least one transoceanic brig. A letter addressed to Colonel Lee dated February 15, 1775, Bilbao, Spain, and signed, Joseph Gardoqui et Fils, refers to an order being filled at Lee’s request. Although the letter never reached Lee, it stands as a record of the clandestine dealings between Lee, the Dutch, and the Spanish. Faithful to the American cause of independence, Colonel Lee met regularly with John Hancock, Samuel Adams, and other members of the secret committee in charge of supplies to plan the procurement of provisions and weapons. Each time that Lee arranged to ship supplies from Spain, Holland, and France to America he risked his business and his life, as the British had him under surveillance. Colonel Lee’s last meeting was on April 18, 1775 (the day preceding the now famous Battles of Lexington and Concord), at Newell’s Tavern in Menotomy (now Arlington), Massachusetts, with another scheduled for the following morning at the Black Horse Tavern where Lee and two other patriot colleagues from Marblehead were lodging overnight. The meeting scheduled for April 19 did not happen. During the British army’s pre-dawn march to Lexington to engage in the battle that officially began the war, the British raided the tavern Lee and the others, Azro Orne and Elbridge Gerry, fled and hid in a cornfield. In the early morning hours the men suffered from exposure, and Lee contracted a fever that led to his death on May 10, 1775. Following Lee’s untimely demise, Gerry continued working seamlessly with Gardoqui. Lee died an unsung hero of the revolution. Fortunately the incriminating letter did not fall into British hands. It remains, however, proof that aid received from the French, Spanish, and Dutch had begun much earlier than the British suspected. Please remember to sign up with your email (your email remains private) so we many signal you when bogs are posted!